Monday December 24th 1894 It was cloudy this morning and I did not try to wash. I was busy about the work all forenoon and sewed some in the afternoon. I began to put a few more rows on a braided rug and worked at that all the evening. 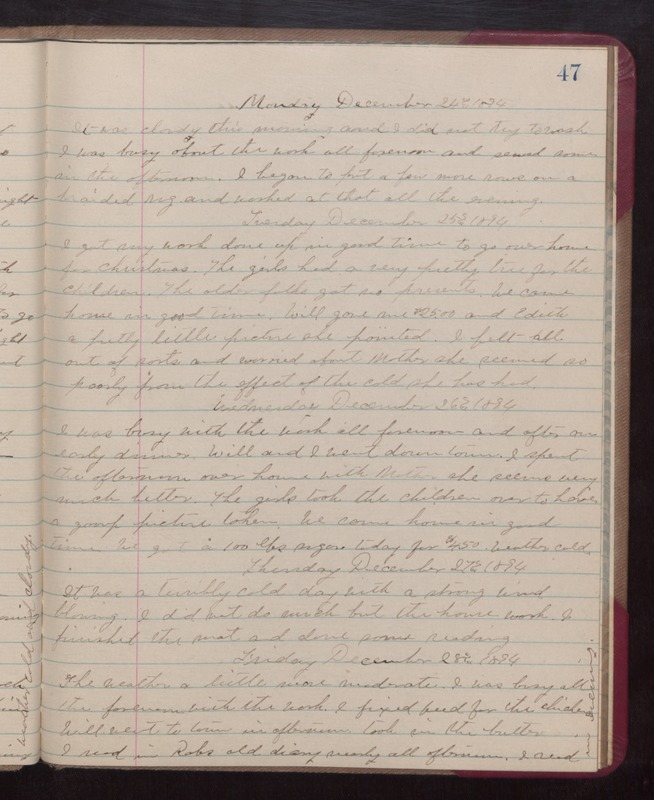 Tuesday December 25th 1894 I got my work done up in good time to go over home for Christmas. The girls had a very pretty tree for the children. The old folks got no presents. We came home in good time. Will gave me $25.00 and Edith a pretty little picture she painted. I felt all out of sorts and worried about Mother, she seems so poorly from the effect of the cold she has had. Wednesday December 26th 1894 I was busy with the work all forenoon and after an early dinner Will and I went down town. I spent the afternoon over home with Mother. She seems very much better. The girls took the children over to have a group picture taken. We came home in good time. We got a 100 lbs sugar today for $4.50. weather cold. Thursday December 27th 1894 It was a terribly cold day with a strong wind blowing. I did not do much but the house work. I finished the mat and done some reading. Friday December 28th 1894 The weather a little more moderate. I was busy all the forenoon with the work. I fixed feed for the chickens. Will went to town in afternoon took in the butter. I read in Robs old diary nearly all afternoon. I read in evening.